Here in China, we just had a public holiday for Mid-Autumn festival. That’s one great thing about China, a crap ton of public holidays (we’ve got a week long one next month). Public Holidays (and Sundays) are my dev days, so this weekend I got about 1.5 days of work done. Sunday was the most productive day, by far. I added in the foundations of the Town Map at the top, randomizing where each of my placeholder buildings is spawned. At the moment, it’s just ‘which blocks behave like which building’, but the ultimate goal is for the blocks themselves to be randomized in their position to create a unique town for every game. 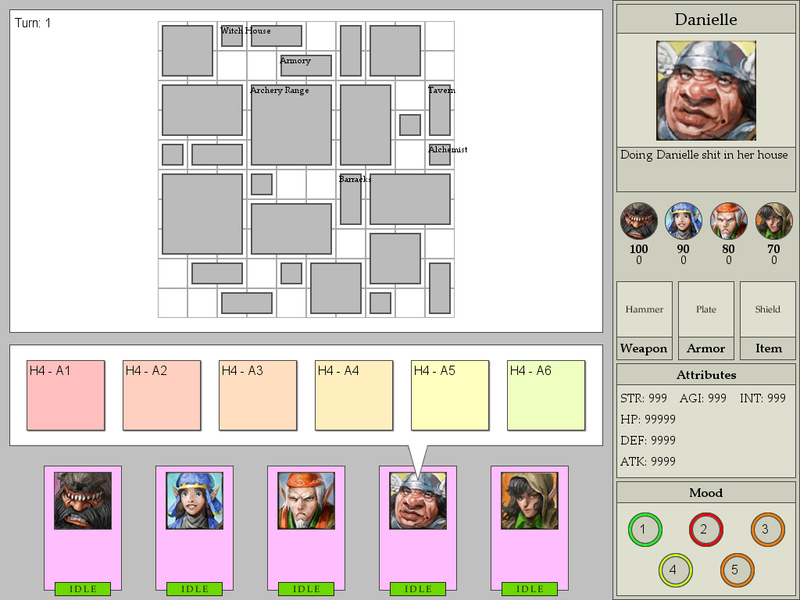 The most obvious addition was the ripped character art from Desktop Dungeons, which I added to make the whole thing a little easier on the eye. Honestly, I don’t like to add art at this stage because I don’t want it distracting from the gameplay… but these heroes are supposed to have personality (it’s the core of the game), so a little art goes a long way to making the game feel right and make the UI readable. Monday was typically slower as I decided I wanted to play some Captain’s Mode Dota 2, which took a few hours out of the day. I added 2 systems though, the first was the Mood UI and foundations for Hero Moods. At the bottom right, you can see a The Sims style Mood gauge area. Depending on the Hero’s personality, they will function better or worse if they have specific moods. Typically being in a good mood will always help, although some more neurotic or darker characters will thrive when they’re depressed or angry. Monday’s work added the UI for this feature, and I’ll probably need to sit down and do some good ol’ design work before coding any more on this. The last thing I added was the Item System. Heroes in Eternal Struggle will have a class and a race that determines which type of Weapon, Armor, and Item they can equip. During the game, players will want to make sure every hero has their loadout completed… with the right items for the dungeon at the end. 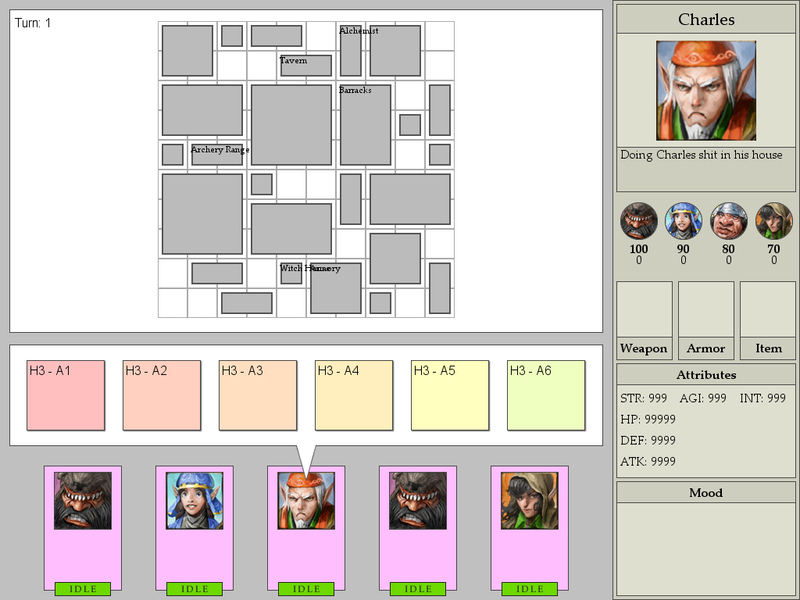 I’ve coded a lot of the basic UI and systems now, so I feel it’s a good time to step back and work on some design. I’ve taken a Game Jam approach with Eternal Struggle, jumping straight into development without really planning how these systems will interact and play out. Next time I think I’ll be working on mapping out what Actions can be taken and how Attributes will effect the Dungeon Battle. I should also probably explain what the hell any of this stuff is! < Previous So, what’s up?